I began this project with an 8-value tonal scale. I do not have the full range of pencils so used those available (4H, H, HB, B, 2B, 4B, 5B & 8B). 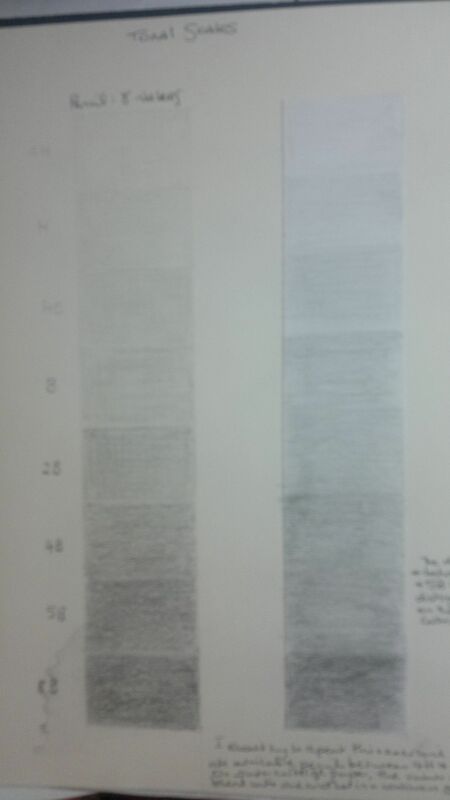 The difference in the two columns is the type of paper. The one on the left is the sketchbook, which has more tooth than the white cartridge paper on the right. The gradual change in value is more subtle between 4B and 5B than between 5B and 8B, as it should be! However, the graduation from B to 2B is not as subtle as it ought to be indicating different pressure of pencil on paper. The graduation between adjacent values is more subtle on the cartridge paper. However, the result could have been improved on both paper types with more care and patience! This exercise took 35-40 minutes. 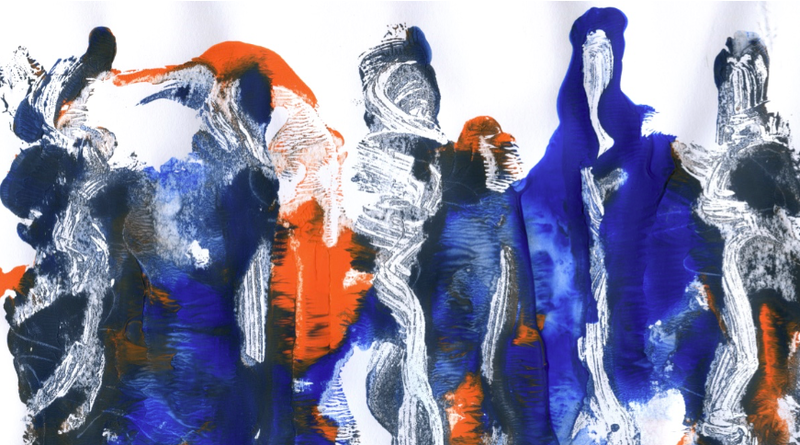 Exercise: Tonal studies: in the next photo, the exercise in tonal variation was extended to include different media. Copic multiliners prove versatile because of the fine marks that are possible. Again, patience produces the best results! 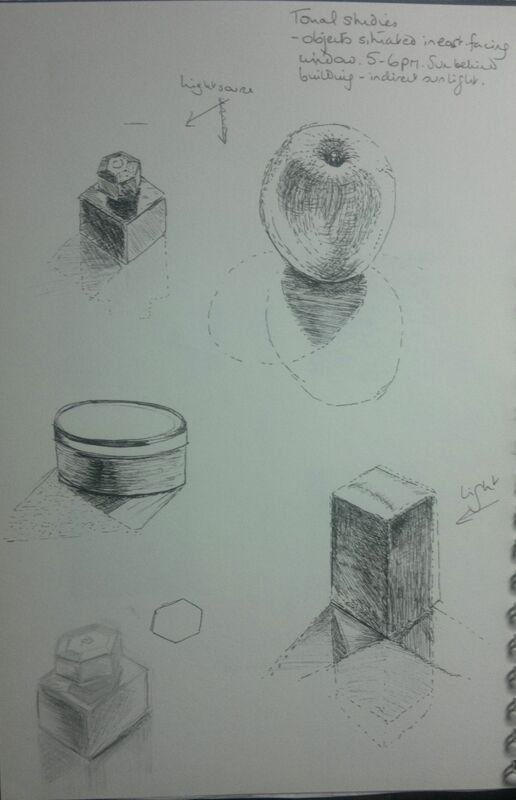 Exercise: observing light and shadow on a surface. 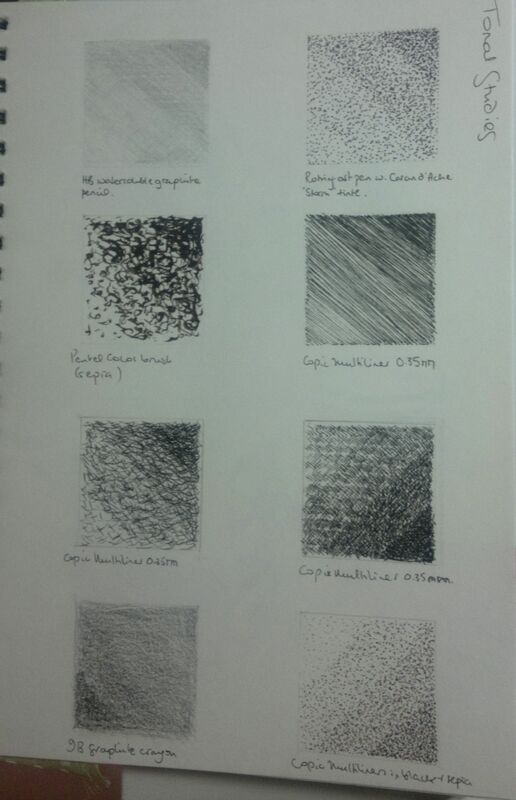 The first part of this exercise involved applying tonal variations in drawing surfaces. The objects chosen were a bottle of ink, an apple, a small round tin, and a box. The ink bottle was drawn in multiliner (top left) and in pencil (bottom left). 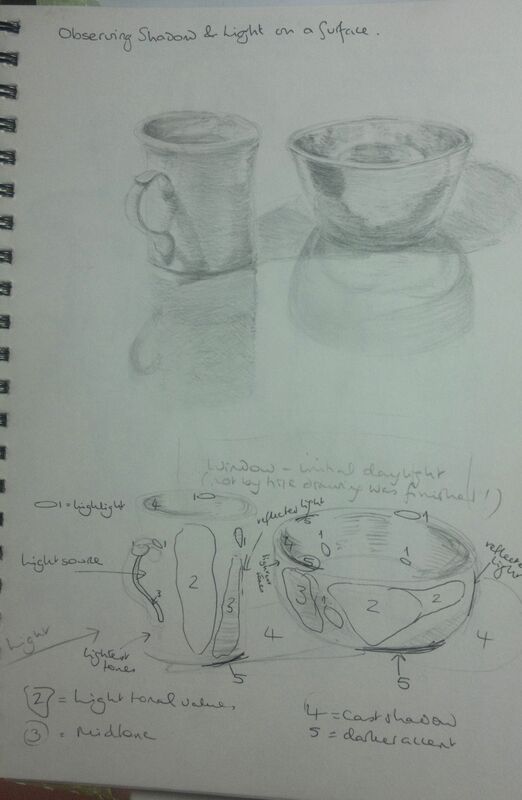 The second part of the exercise involved applying the earlier exercises in this section to a still life. A china beaker and a metal bowl were chosen as both have reflective surfaces. This drawing took about two hours. It began in evening light in a window but with a lamp above left. As the light darkened outside, the lamp became the dominant light source so that, finally, the reflections in front of the objects were no longer appreciably visible. I like the ambiguity of the shadows in the drawing due to the different sources of light but this made the exercise more complex. The sketch below the drawing should have been done first (!) as it would have helped to map out similar areas of tone. however, it was done with a single light source and so is not exactly the same as the drawing. The biggest challenges were gradation of tone and identifying areas of reflected light (although these will be found facing away from the light source so can, therefore, be sought out). Using two reflective surfaces further complicated the exercise under changing light conditions but I quite like the finished drawing.